Last week, I finally made homemade pizza again. 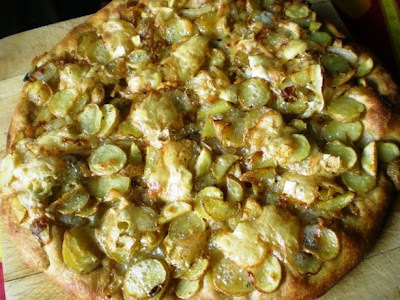 This time I made a potato pizza with brie cheese and caramelized onions on a whole wheat crust. I got the idea for this pizza at my gym of all places. They had an Open House where they served gourmet pizza, and I got a small slice. The slice I got was potato pizza with caramelized onions and truffle oil and a Spanish "brie-like" cheese (that's what the server called it). 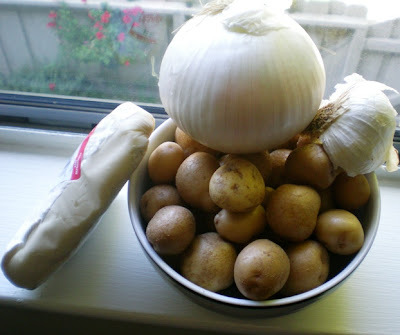 Here are the raw ingredients. Aren't the baby potatoes cute? 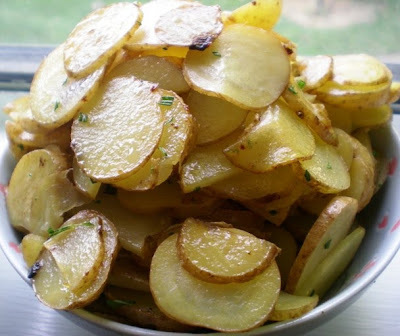 And here are the sauteed potatoes, caramelized onions and garlic, and the pieces of brie. Here is the pizza before I put it in a 450 degree preheated oven for about 15 minutes. 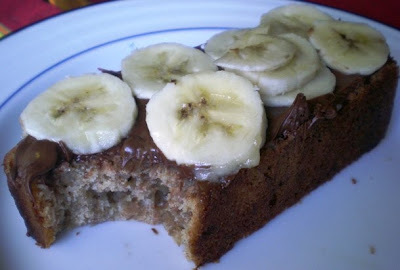 And here it is after it came out of the oven. Question: When was the last time you ate pizza? What were the toppings? My afternoon workouts have gotten much easier over just a few short weeks. I think the above, common-sense strategies (that I should do automatically anyway) really helped. Plus, I think my body is getting used to the afternoon workouts. 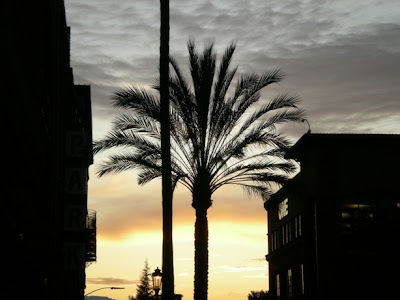 Questions: What time of day is your favorite time to work out? Do you ever have to adjust your workout schedule? What are some strategies you use to help your body adjust to a new workout schedule? 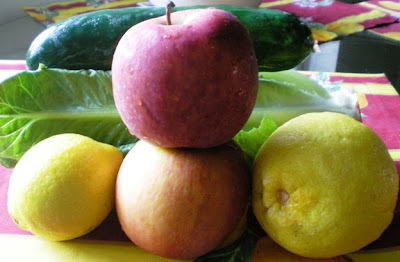 So yesterday I finally made some juice out of one head of Romaine lettuce, one cucumber, two lemons, and two apples. I don't think I'll be able to make juice every morning as I had originally planned. Somehow making juice at 5 in the morning seems a lot better in theory than in reality... But I think making juice maybe three or four times a week will be doable! 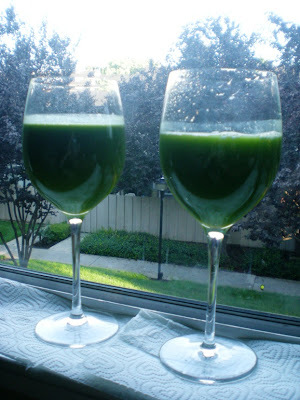 Questions: Do you like fresh juice? Do you have a juicer? What's your favorite juice? 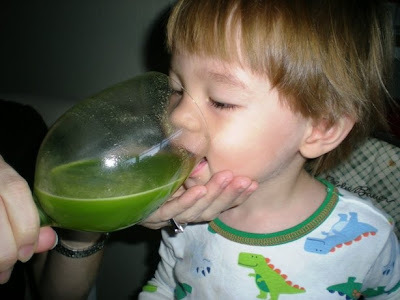 If you have a juicer, how often do you use it? 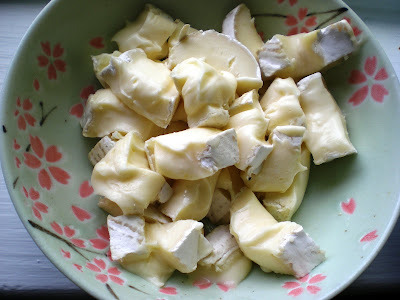 Question: What was the last cheese that you ate? Did you like it? 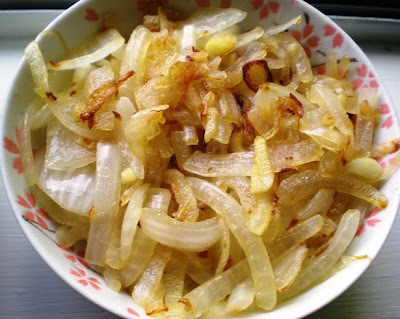 I started by sauteing the onions, garlic, and ground ginger in some olive oil. 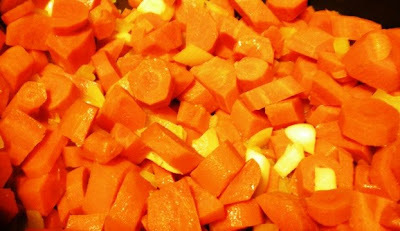 Then I added the carrots which I had cut into small pieces. After cooking the carrots for about 10 minutes, I added 1 cup of vegetable broth and cooked the carrots and broth for another 10 minutes. 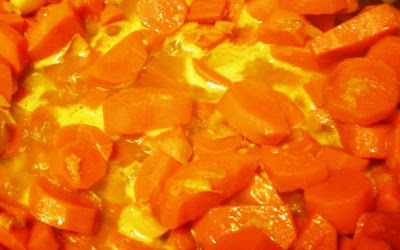 After the carrots were soft, I added the remaining broth and cooked the soup for another 10 minutes. Then I pureed everything with my hand-held blender. Because I was running late, I ended up not making any croutons but toasted some whole wheat bread instead. 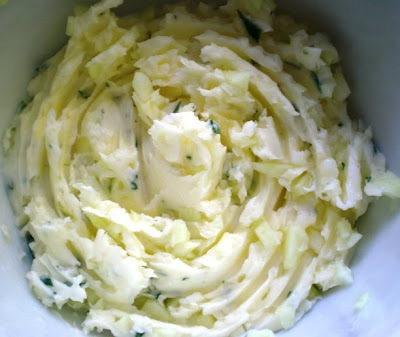 I also mixed a little bit of soft butter with some garlic that I had smashed up with a bit of salt to put on the toast. 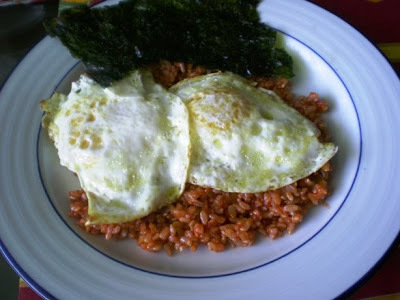 When hubby and I first started dating, we ate a lot of "flavored" rice with over-easy eggs and seaweed on the side. In fact, it's the first (and pretty much only dish) he has ever made for me. 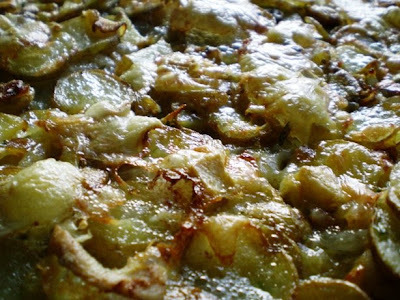 So to me, this simple, slightly strange dish, is true comfort food! 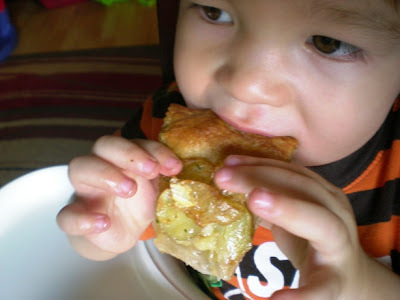 Question: What's your favorite meal from your childhood? The toddler and I got the same thing as we got last time (salad & mini burgers and french fries from the kids' menu). But hubby and the teenager went to town. They shared an order of fries, and each got a big burger. Hubby got the old school burger. The teenager got the 2/3 pound custom burger with tomatoes, jalapenos, caramelized onions, lettuce, feta cheese & honey mustard dressing. 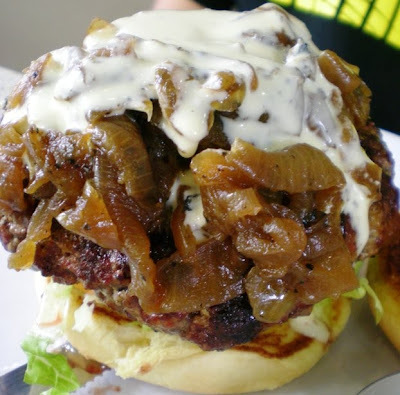 Questions: Do you like burgers (meat or meatless)? 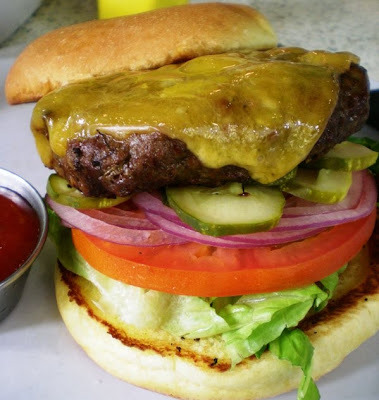 What's your favorite burger? What do you like to put in your burger? Tuesday: Spinach salad and salmon cakes. 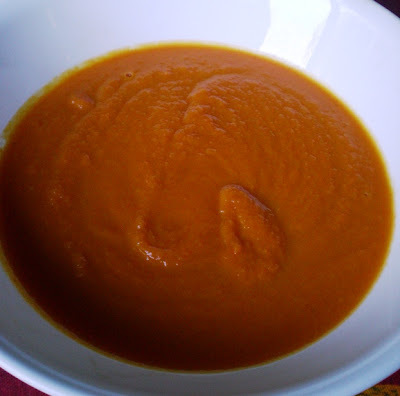 Wednesday: Carrot/ginger soup. 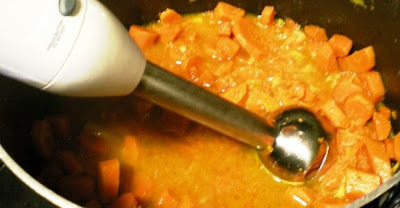 I used to make a carrot/ginger soup a long time ago, but I'm not sure if I still have the recipe. 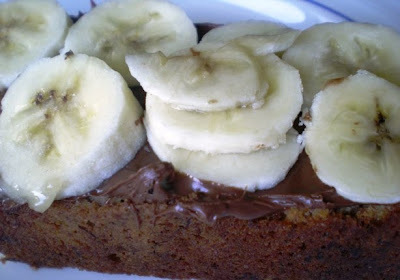 If not, I think I have seen numerous versions on other blogs recently, so I'm sure I can find a recipe. I'll also make some homemade croutons. Thursday: I think it's time for pizza again. 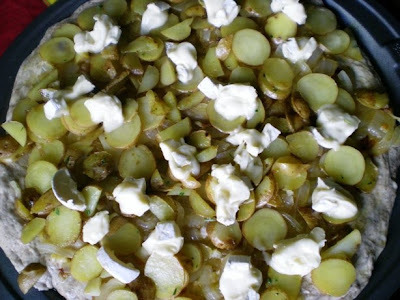 I'll make some more homemade whole wheat pizza dough and experiment with the toppings. Friday: It's "Salad Friday." I somehow think cabbage salad is not quite meant to be at this point.... So I'll make my Taco Salad. 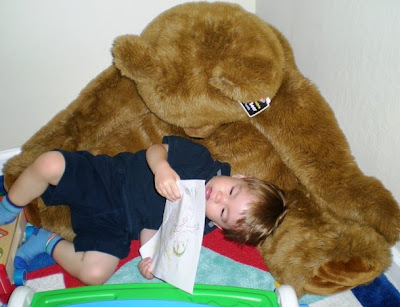 Question: I have asked this before, and I loved all your answers and got many ideas... So here we go again: What's your favorite salad at the moment? 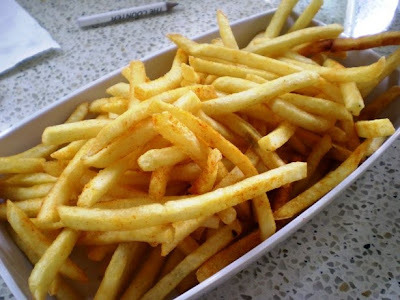 In the past, when life got tough, I usually stopped exercising regularly, and I also didn't eat as well as I should have. I somehow thought that life challenges gave me permission not to take care of myself and the results weren't pretty (physically, mentally, and health-wise)... So this time when things got tough, I was determined to do things differently. I realized that I have to work out regularly because exercise actually gives me energy. I also realized that planning meals makes life easier and that eating nutritious food is the best thing I can do for my body. For the past four weeks, I have worked out almost every day, and I have also continued to plan meals and make and eat healthy foods. And I'm proud of this! Question: How do you make sure you continue to make healthy choices when life gets tough? 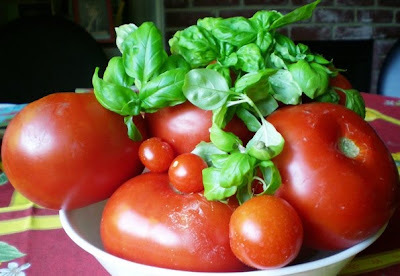 Here is a picture of the tomatoes and basil after I picked them. 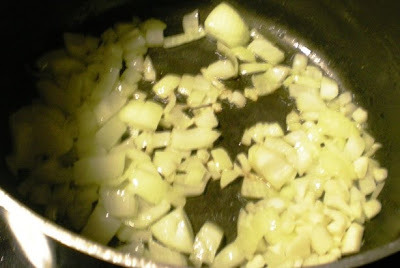 I started by sauteing some onions and garlic in a bit of olive oil. 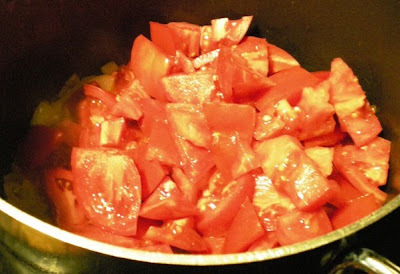 Then I added the tomatoes. 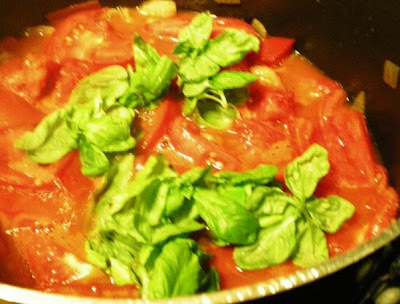 I let the tomatoes cook for about ten minutes before I added the basil as well as one cup of vegetable broth. I also added some salt and pepper. 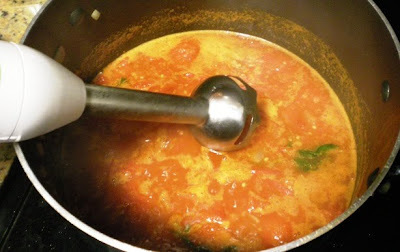 I continued to simmer the tomatoes for another fifteen minutes and then used my immersion blender to puree everything. After the soup was pureed, I cooked it for an additional 10 minutes. 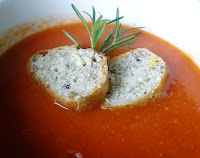 Here is a picture of the finished soup. To make the croutons, I cut some leftover walnut baguette into thin slices. I usually buy a walnut baguette from my favorite baker at the Farmers' Market every other week and freeze half as soon as I get home. 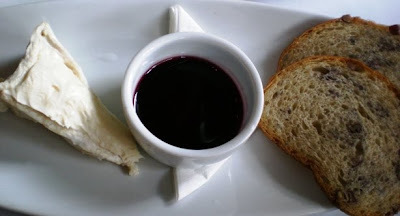 The baguette is kind of pricey, and freezing half assures we get to enjoy some the next week as well. 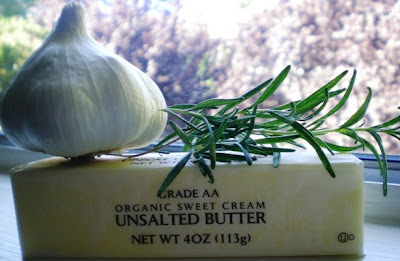 I spread a bit of the garlic rosemary butter on each slice of bread. 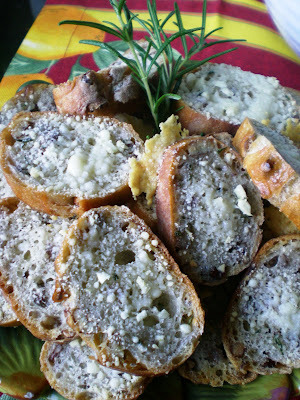 I then baked the bread slices in a 450 degree oven for about 7 minutes, at which time I topped them with some Parmesan cheese and baked them for a few more minutes. Finally, here is a picture of my bowl of soup with some croutons. It was very good. I neither peel nor seed the tomatoes to make this soup. The soup is therefore kind of thick. I love it that way. 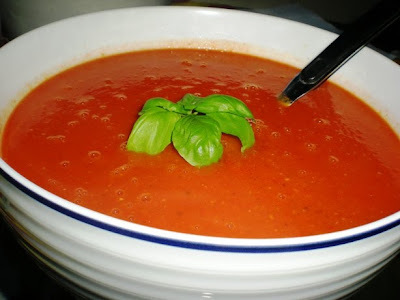 However, if you prefer a thinner soup, you can blanch the tomatoes (put the tomatoes in a pot of boiling water for about one minute and then transfer them to a bowl of ice water). You can then skin them easily and also take out the seeds. 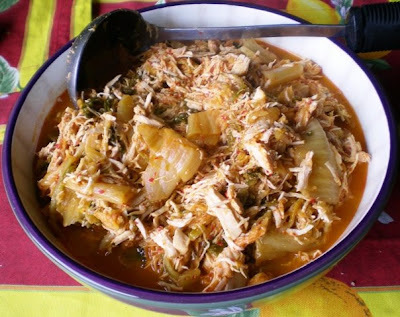 Questions: What's your favorite soup? When was the last time you had it? 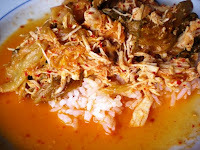 My favorite comfort food is kimchi stew (kimchi jjigae). 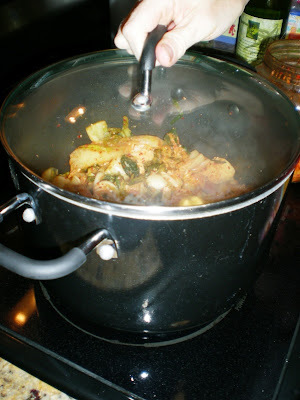 Well, I shouldn't really call it kimchi jjigae since what I make is truly not traditional. First of all, usually it is made with pork, but when I made it this week, I used chicken. I also didn't use any of the flavorings that are often used. We always have a big jar of kimchi in our fridge. 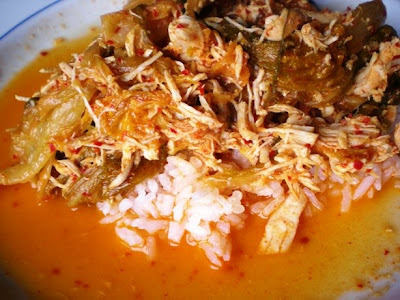 Usually, my mother-in-law makes kimchi and gives us some. On the rare occasion that she doesn't give us any, we buy it. I guess making kimchi could be a fun project one of these days... 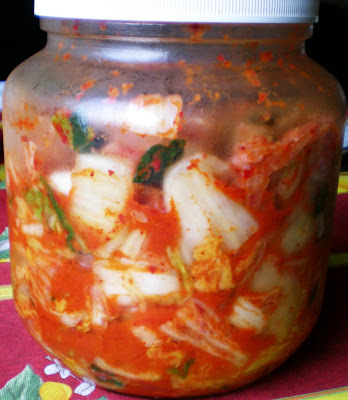 Anyway, here is the jar of kimchi that was quite ripe and therefore perfect for kimchi stew. 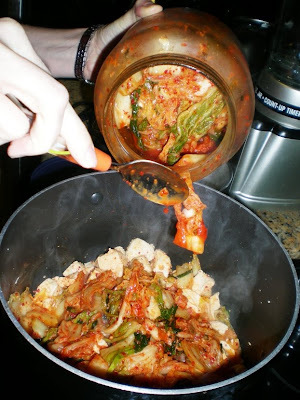 I simply sauteed some chicken in some olive oil and after the chicken was browned, I added the kimchi a bit of water. Then I reduced the heat and let the stew simmer for a few hours. After a few hours, the chicken was all shredded and very flavorful. Before serving the dish, I added a bit of sesame oil. 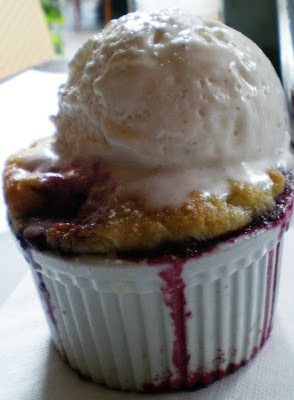 Question: What's your favorite comfort food? 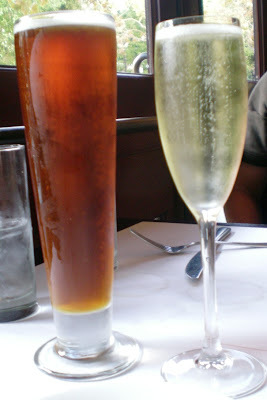 Hubby got a beer, and I got a glass of Prosecco. 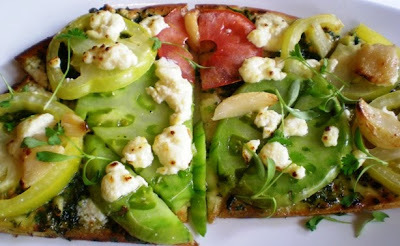 We also got some flat bread with heirloom tomatoes, goat cheese & roasted garlic. 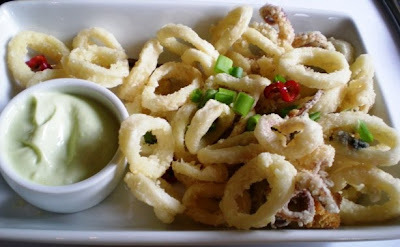 Plus some calamari - I was a bit worried when they came out because they were so light, but they were delicious! 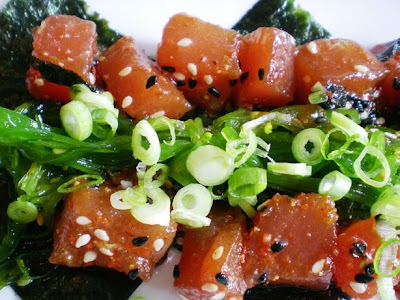 Ahi Tuna Poke - I could eat this dish every single day! 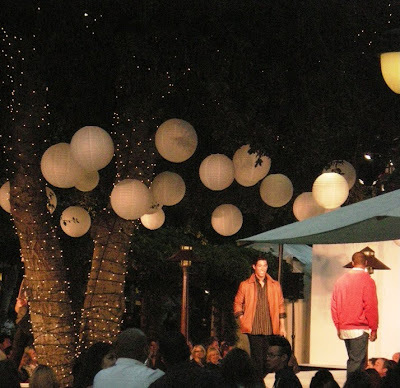 After our "small plates," we got to catch part of an outdoor fashion show. Question: What are you thankful for today?